Later topic: Reassembling the inking disk on a C&P 10x15. I recently purchased my first press- a Kelsey 5X8 model O online. 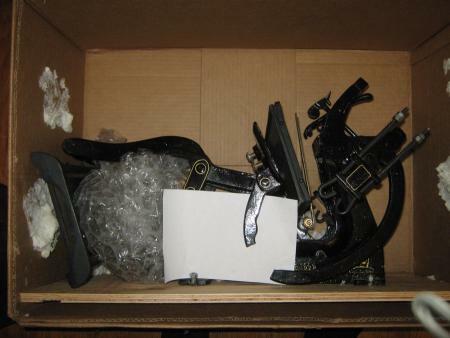 The gentleman I purchased it from, was quite good about packing securely, however despite that- when the press arrived the gooseneck on the press was snapped clean in half. The guy I bought it from is willing to compensate me for the cost of repairs, however I will need to arrange repairs. What can be done? Can I use a strong adhesive like WellBond, or am I going to need to contact a machinist company/ someone that does welding? The photo below, shows the press, with most of the peanuts and packing material cleared out. I have slipped a piece of blank paper between the gooseneck and body of the press to clearly illustrate the damage. For it to operate reliably, you’ll need to have it braised. T and T press might be able to help you- they’re on here, just search in the yellow pages. The website you sent looks good- but I live in Amherst, MA, and shipping (even if I just removed that specific piece from the press for repair) will take an awfully long while/ would need to be packaged v. carefully. Is there anyone closer by that could carry out such delicate repairs? You’re worried about shipping from MA to MN? A courier can have it there in a few days if you’re very concerned about time, for probably less than $25 (fed-ex ground $16, Friday delivery), and packaging is as easy as plastic-wrapping the thing to a piece of plywood or thick cardboard and sticking that in a box padded with newspaper. How quickly and cheaply were you expecting? You might find someone local that knows what they’re doing, or you might find someone that “knows what they’re doing” and end up with even more damage. With all due respect I do’t see how it hurts ask if anyone knows if there is a qualified local person I could see about fixing the gooseneck. I don’t have that much spare cash, so its worth asking. You are not too far from Letterpress Things, John Barrett who runs it is very knowledgable and should be able to steer you in the right direction. he sometimes has Kelsey parts. 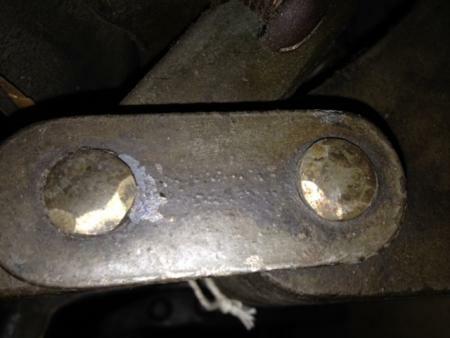 I can recommend a very capable welder/brazer that I have worked with in western CT, about 2.5 hours away from you. LMK if you are interested. I’m just up the hill in Plainfield, so if you have any letterpress questions give a holler! I’ll also throw in for contacting John Barrett. You want to make sure the company you choose to do the welding is very familiar with the specific aspects of welding this type of cast iron. Contacting John Barrett sounds like a great idea - and thank you Steve! Letterpress Things looks like a great store- it probably also has the platen back spring, etc. that I need for my press. Yeah - John Barret. He’s near you, very helpful and if anyone in your area can help you, he’s the one. Besides, he could be an excellent resource for you for all things letterpress for years to come. However, just to let you know, two days ago, I picked up a freshly-cast 6x10 Model X gooseneck from the foundry. If John can’t help you, we can make a new one using one of mine as a pattern. But that would take a month or more, so I could send you one of mine and just have a replacement cast for myself. I have more than a dozen presses to restore, so I have the time. With a new press, I’m sure you want to get printing right away. For that reason alone, a visit to meet John Barret - right now - would be a very good idea. So try him first, and use me as a backup. Oh - and, btw. Changing that part is very, very easy. Removing shafts from the Kelsey 5 X 8 Model O, in order to remove the goose neck is far from easy. It must be noted that during the assembly of this model many of the shafts ends are slightly mushroomed (peened over) to inhibit lateral shaft movement during press operation. In some cases the shorter shafts, e.g. those found on the ends of the shafts attaching the goose neck to the platen and the roller arm assembly have but one end peened. Considering this a shaft end must be ground flat in order to clear the part hole I.D. Additionally the shaft on the platen end must to driven out from the platen spring end. The challenge here is that the platen spring and platen stump are in the way. I use a 12” long 3/16” bent drift pin to knock this shaft out. When disassembling a Kelsey press always drive the shafts out from left to right, with the exception of the left hand lever to platen shaft. All Kelsey shafts were struck with a chisel near the shaft end raising a bit of material to aid in retention. Be extra careful and always back up your parts when driving shafts free to reduce the risk of breaking the cast steel parts. On the other hand… to Allen’s point removing shafts from a Model U is much easier as retaining clips were used on the shaft ends. It is also important to note that after all these years presses surface that have been modified, So, to assume the set up is as it came from the factory could be false. Seems just about every press we restore has been tampered with in one way or another, especially the very old ones. 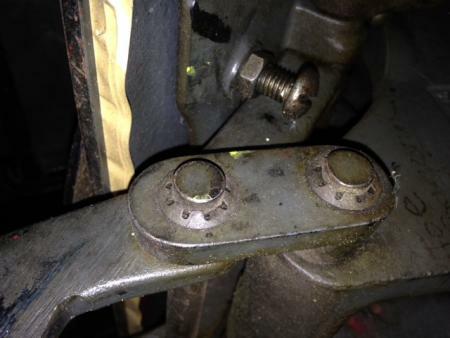 Thank you for your advice- do you have any photos of the shafts peened vs not peened? I’m ok with basic mechanical tasks, but I’m a little out of my league with this. The press is in pretty good shape and looks like it hasn’t been interfered with much but still - like you said- its entirely possible that someone has fiddled with it in the past.